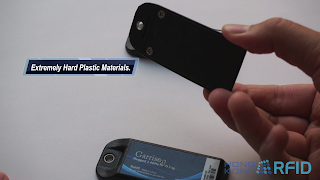 RFID Bloggy'n Tips: Watch me replacing the coin battery for Hussar and Garrison Tag. Watch me replacing the coin battery for Hussar and Garrison Tag. Many people may not understand how RFID tags work, let alone having an idea of how to change their batteries. Here you will have a deep insight into how easy that can be! This time our focus is on two tags, Hussar tag (NT02) and Garrison tag (RT02) respectively. The frequency of all our active RFID tags are 2.4Ghz band. The former one is generally for convenient access tracking with its characteristics of extremely small, slim and light design; the later one is for asset management at industrial level, made of super hard plastic materials with its characteristics of mount-on-metal, dust-proof and waterproof . Garrison Tag also has bluetooth low energy (BT4.0), which is an open-protocol option. For these two powerful tags, the process of changing batteries is NOT complicated at all. With its user-friendly design, it only takes you almost 1/6 time of cooking a cup noodle, as easy as changing the battery of your mobile phone!